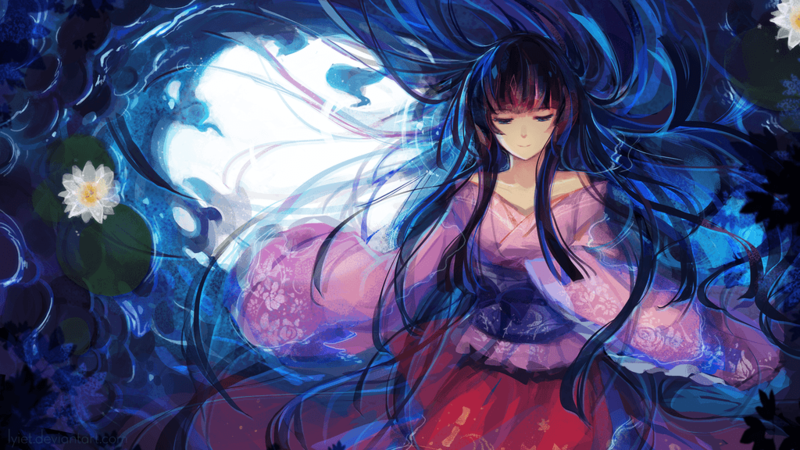 Also known as Kaguya 1.0, Seer of the Blue Moon previously saw fringe play because there were not enough versatile chant-standby and stealth effects in the card pool. With the release of The Moonlit Savior, she now has access to one of the best stealth kill effects ever printed in The Executioner and a powerful cancel + kill standby in Prison of the Lunar Lake. While there are many ways to build Seer, I opted for a black/blue route as it offers a nice balance between destructive (destroy resonator, discard, etc.) and constructive (draw a card, search, etc.) effects. This deck aims to trigger standbys to stabilize in the early turns before deploying medium-cost threats to take over the game. 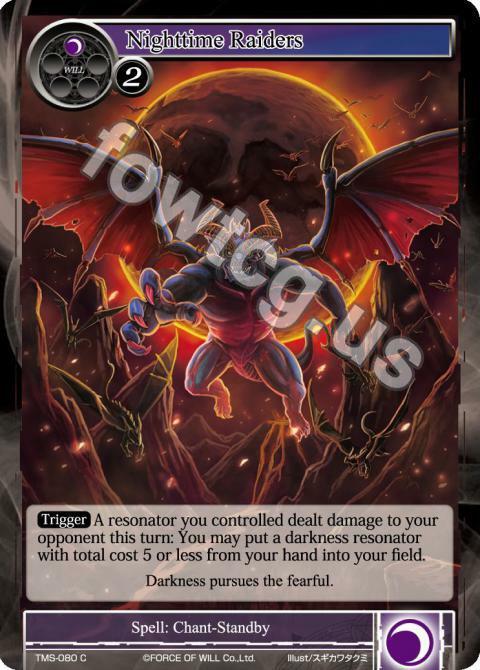 The Executioner is strong in every matchup except resonator-less control (which often loses to aggro/burn), while Prison in the Lunar Lake cancels enter-the-battlefield automatic abilities in addition to destroying the resonator (including Lancelot when it attacks!). Since the opponent doesn’t get to see what we set in the chant-standby area, he or she has to guess what to play around. I have won games by bluffing a Sign when it was actually an Executioner, and I have also made my opponents think I have a Sign when it was actually a Prison I was saving for a specific trigger. The Executioner is the best out of these and we not only run the full four but also mulligan very hard for them. 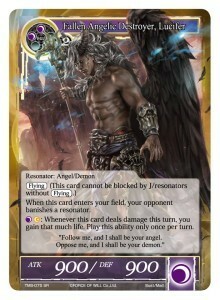 Lucifer gets around Excalibur X to deal with Alice, provides an out to Arthur Pendragon, offers necessary lifegain to put us out of burn reach, and is a flier to stave off a Pumpkin Witch finish. 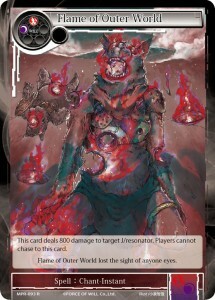 Nyarlathotep gives us vital information and the ability to remove our opponent’s best card in hand. 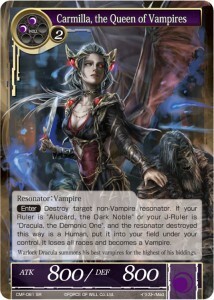 Carmilla is a removal effect on a body that gets around Refrain in the later stages of the game. Stoning is the cheapest unconditional resonator killer at instant speed. Space-Time Anomaly is a double-cantrip thanks to Remnant and it also hits J-Rulers. Scorn lets us see the opponent’s hand and plan our next turn while also taking their best resonator. 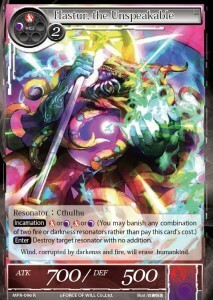 Combined with the chant-standby cards and value resonators, this deck plays nearly all the good removal in the game. 1 Black Moon’s Memoria, 1 Magic Stone of Moon Shade: These enable 5 sources of blue/black and 2 sources of moon to activate Lucifer’s lifegain ability. Both are crucial to have in many matchups, although neither allow us to trigger The Executioner or Prison if we call them in the early turns, which can be awkward at times. 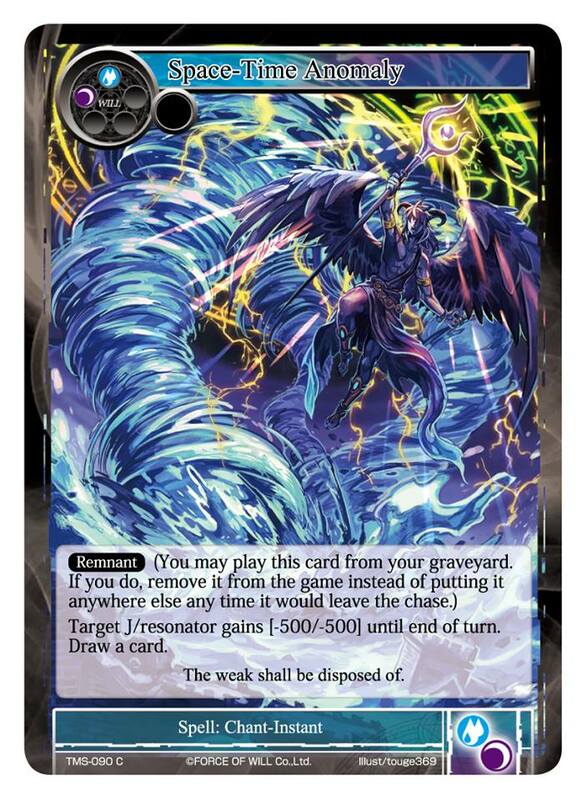 1 Horn of Sacred Beasts: In a drawn out control mirror, shuffling your graveyard back into your deck will keep you from decking yourself. 1 Vlad Tepes: If your opponent sides Vlad against you, then side Vlad back (cutting Executioners for Spirals) in the next game. Vlad usually wins in a control mirror, but it’s a judgment call when to side him blindly because Seer is actually better in many matchups. If your opponent employs a lot of counterspells but very few threats, Vlad is fine to bring in as your removal will accumulate in hand for most of the game. 1 Girl in Twilight Garb, 1 Schrodinger, the Fallen Black Cat: Reanimator decks are a problem for us since we employ a lot of discard effects. 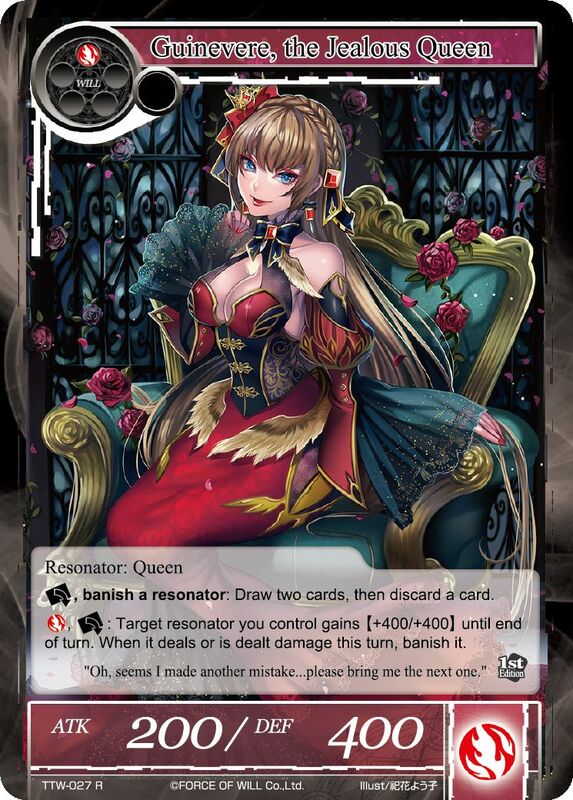 Dark Alice is the best way to combat reanimation strategies without making our discard effects feel awkward. Why Aren’t You Running These? Underground Dragger is easy to trigger against aggro but hard to rely on against midrange and control. Since we want to be effective against a general field, we prefer to run cards that are independently powerful. Rasputin is a dead draw lategame because she doesn’t do anything on her own. We also only run 4 incarnation resonators, so Rasputin fails to make the cut. Nighttime Raiders is card disadvantage for tempo, which doesn’t fit our gameplan. It’s also difficult to trigger in blue/black. The main reason to run blue over red is the access to constructive effects such as draw power. The initial Seer list I settled on was black/red with tons of destructive effects that 2-for-1 the opponent. The problem with this strategy is if your opponent is playing a highly constructive deck with lots of cantrips, you’re not actually pulling ahead in the long run – you’re simply going even. By combining constructive effects alongside destructive ones, the deck is able to enter the lategame with more resources than the opponent. The downside is it becomes weaker to J-Ruler strategies and imperishable effects since we cannot run Flame, but thanks to versatile threats and removal we can often fight through them. Split is killer against a deck looking to play a long game without counterspells. Dismantle Them at Every Step. Out-Resource Them. Accumulate Small Advantages to Victory. This deck lacks an elaborate finish. It demands high skill to pilot and the ability to assess the opponent’s gameplan and adapt accordingly at every stage of the game. Think of it like trench warfare – every little bit matters and a single mistake can cost you everything. In most cases where you must make a decision, you should play for the long game. Aggro aims to whittle you down to 20 or less life and finish you with either Pumpkin Witch or burn or both. 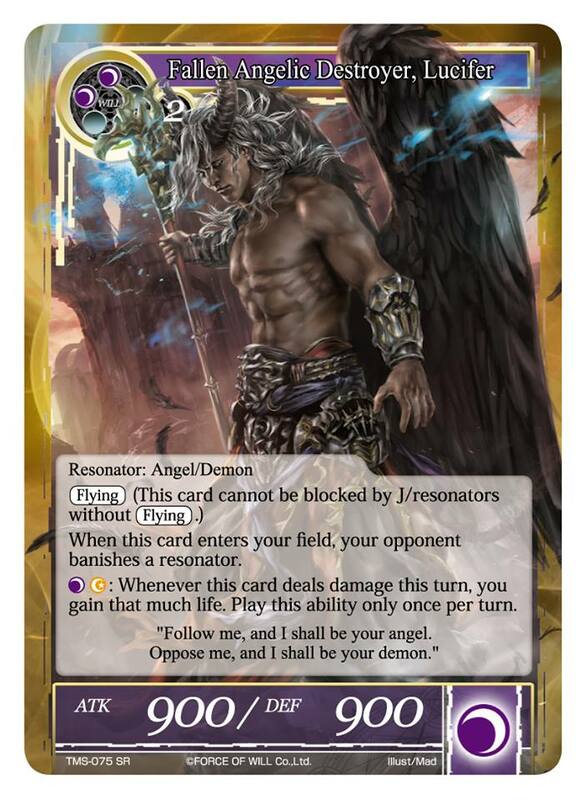 Remove its threats, resolve a Lucifer and start putting yourself out of reach with his lifegain ability. Demolish the relevant threats in hand and on field using your versatile removal suite. Ensure that you squeeze in every little bit of damage. They will eventually get their combo – disrupt them long enough to kill them first. Maximize 2-for-1s while removing threats on board and problem cards in hand. 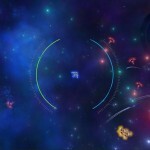 Aim to win the resource war and accumulate your own threats to win the lategame. T2 Play Scorn (do this first after calling stone to get around Wall of Wind and gain info on their hand) and then set another chant-standby or resolve a Barrier. Double Scorn is also a strong T2 play. However, if you already know what you are playing against then you should mulligan accordingly for the best cards in that matchup. Space-Time Anomaly can target J-Rulers and always cantrips even if the target does not exist upon resolution. The only time you don’t draw a card from Anomaly is if Anomaly is countered. 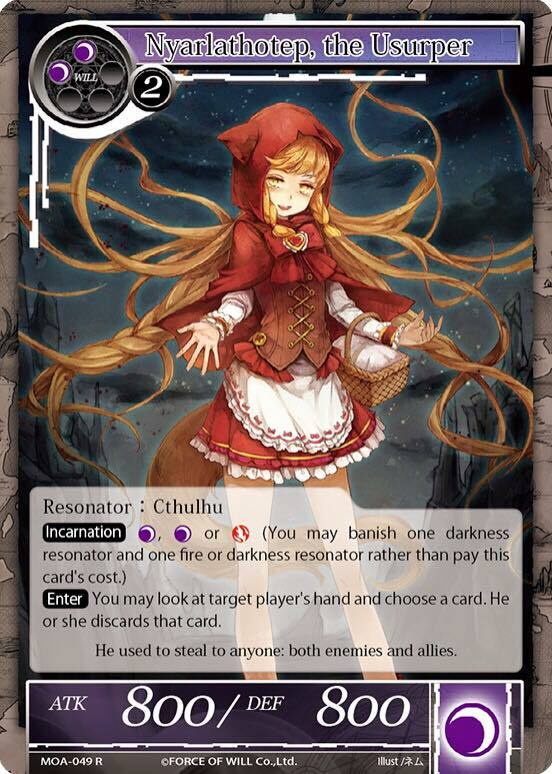 Also, don’t forget this card has Remnant! Be mindful your graveyard. Prison in the Lunar Lake targets abilities on the chase, not resonators. 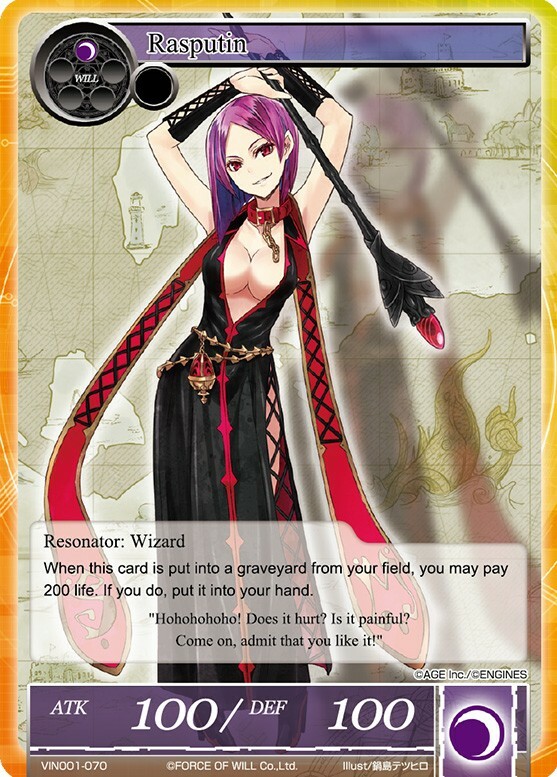 You can destroy a Cheshire Cat with Prison (and prevent the card draw) or use it to prevent the damage dealt by Mephistopheles‘s target trigger or Pricia‘s enter-the-graveyard damage trigger. You can trigger Stealth resonators the turn they are set if their trigger condition is met. This means if your opponent quickcasts a resonator on your turn, you can set The Executioner and trigger it in the same turn to destroy any resonator with cost 3 or less. You can trigger Sign to the Future while an incarnation resonator is on the chase. For example, if your opponent has 3 resonators and you have 2 Executioners, you can banish both Executioners to cast Nyarlathotep and respond with Sign. 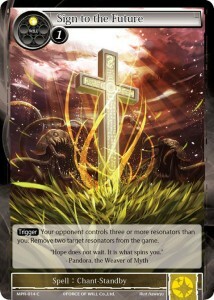 Since you control zero resonators while Nyarlathotep is on the chase, Sign‘s trigger condition is met. 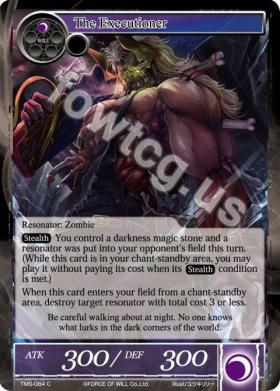 You can attack with Cheshire Cats into a rested J/resonator your opponent controls to help you trigger Sign. In general, you should cast Nyarlathotep before Scorn in case the opponent doesn’t have any resonators in hand. 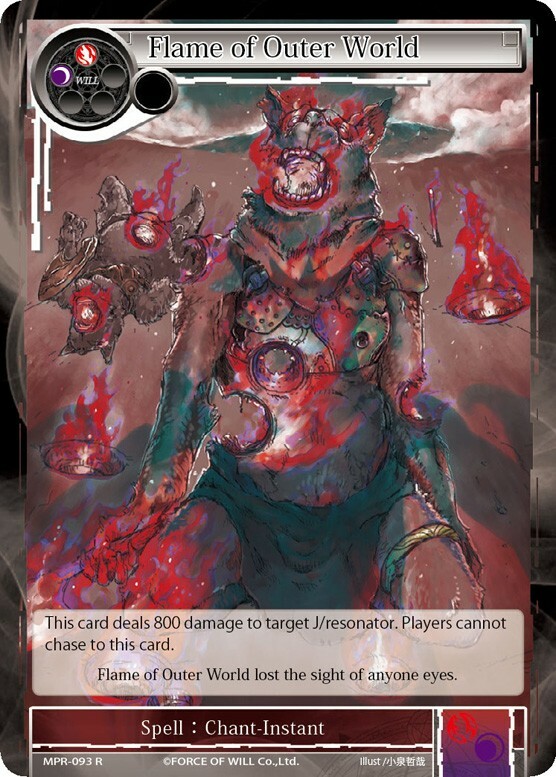 However, if you believe Nyarlathotep may be countered and you desperately need a window to resolve it, you should scout the opponent’s hand by casting Scorn first. 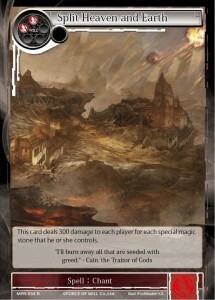 To play around Wall of Wind, first play cards that use the chase (i.e. cast Scorn first) before resting stones to set cards in the chant-standby area. 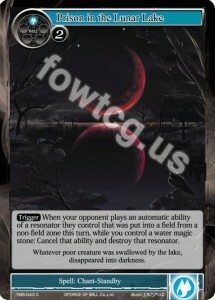 Your opponent can use Wall to counter a triggered standby, but they cannot cast Wall in response to setting a card in the chant-standby zone. If your hand is garbage, you can bluff setting a card in the chant-standby area. Your opponent will usually respect it, which could buy you valuable time. Sideboarding is about asking yourself the proper questions. You should have a feel for the opponent’s strategy after the first game and be able to decipher what is important in the matchup. 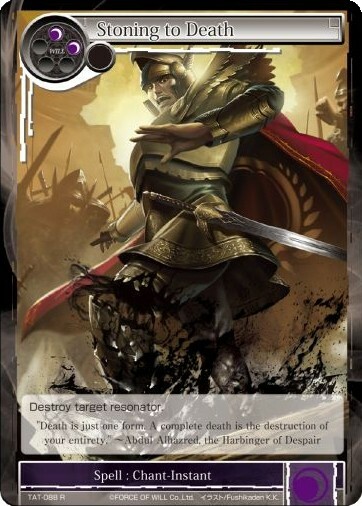 Is your opponent packing a lot of reactive cards or looking to combo you out in a single turn? 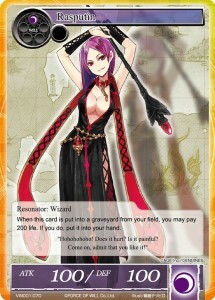 Spiral of Despair will get cards out of the opponent’s hand so you’re always ahead in the resource war. Also consider siding into Vlad if you believe the game will go long. 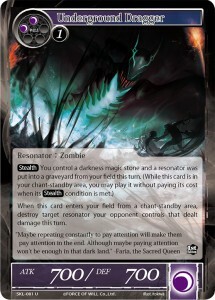 Is your opponent playing reanimator, which makes your discard outlets look bad? Try siding into Dark Alice and Schrodinger. Note that if you side out of Seer for any reason it’s a good idea to side out some number of Executioners. In testing, there was only one match where I played against a reanimator deck and I wasn’t recording at that time. I ended up losing the match but we played an additional game 4 where I sided into Dark Alice and the matchup became much more favorable. 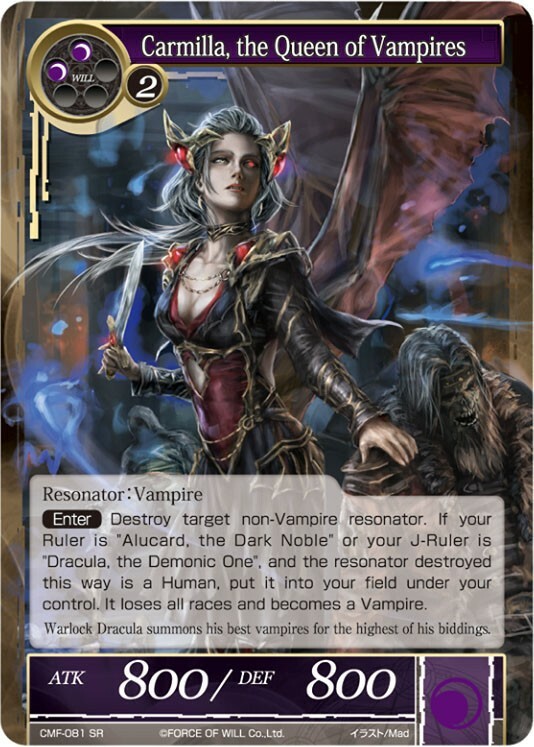 I haven’t tested the reanimator matchup extensively (it’s not very popular) but I believe Dark Alice shores up that weakness. Is your opponent playing orbs? If so, side into the Heras because Seer wants to play a long game and eventually they will have stones to pay for Barriers. Siding into the third Barrier is usually still correct because preventing a fast flip into Refrain (or any J-Ruler) forces them to play more conservatively. If your opponent is playing a J-Ruler centric strategy, you should bring in some number of Deathscythes (the full four against Bahamut or Cain, less against almost anything else). Is your opponent playing a swarm deck? Bring in the fourth Sign. Note: Some mainboard and sideboard slots are different in these videos as I was testing tech and numbers. You can find the specific list in each video’s YouTube description but the list in each video is very similar to the one in this article. 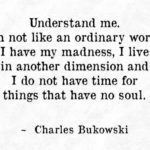 Can It Beat Alice’s World? I’m not sure why this list came under such scrutiny. When I was working on my Sylvia deck nobody ever asked me about the Alice’s World matchup. The same goes for other content providers – nobody asks if decks made by Six Sages Gaming or FOWTavern can take on World. It’s strange to hear people inquire if this can defeat the best competitive deck. However, if people are holding my lists to a higher standard than Six Sages Gaming or FOWTavern then I definitely appreciate that. Dismantle the Opponent. Win the Lategame. I thought you had to have a light source to activate Sign when face down. You don’t have to have any specific will sources to activate a trigger from the chant-standby area. 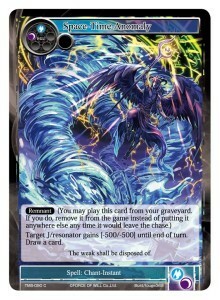 I’m confused on the purpose of Horn of Sacred Beast in the AW deck. At around 1:53:00 you ask if he’s getting Speaker of Creation to the top with Hydromonica and he responds with “No, I have only 2 Alice’s World.” You then say “Oh that’s right you don’t play Horn”. How does Horn correspond with the Alice’s Worlds if they are Addition:Fields? Horn is what allows Alice’s World it take more than 2 turns even though they only run 2 Alice’s World. Horn in play along with Alice’s World, play Speaker of Creation. – Speaker search trigger goes on chase. – Respond to trigger by activating Speaker’s ability to banish itself and destroy an Addition: Field, choosing Alice’s World as target. 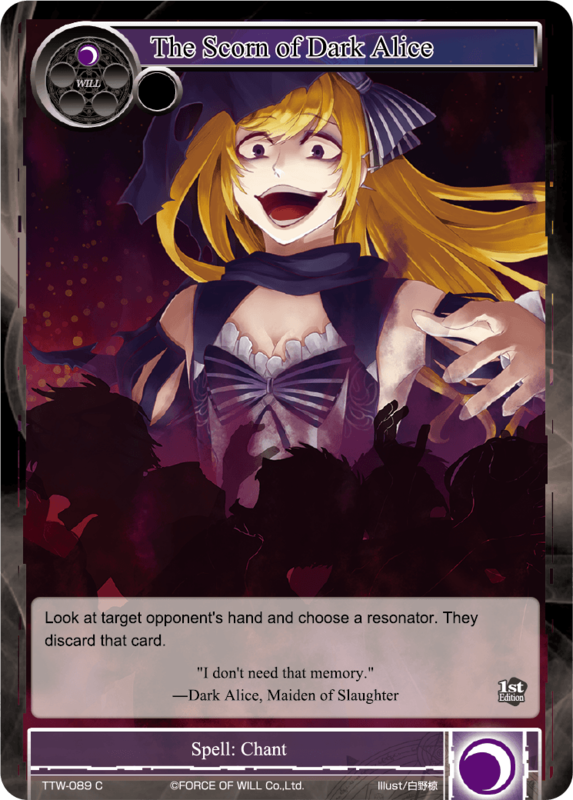 – After Alice’s World goes to grave, chase Speaker’s search trigger again with Horn to shuffle your grave back into your deck. 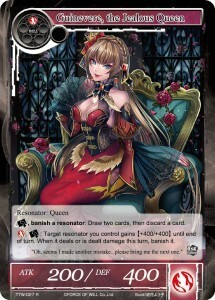 – Let the Speaker search trigger resolve, allowing you to grab Alice’s World from your deck.